International buyers will make up 86% of the e-commerce market in 2015, according to eMarketer. With the demand for American-made products higher than ever, e-commerce sellers in the U.S. cannot afford to ignore the growing segment of international customers that is expected to reach a record high of 1.06 billion buyers in 2015. Check’s out Stamps.com’s new eBook (PDF), Complete Guide to USPS International Shipping to get a comprehensive understanding of how to ship packages across the world using the USPS. The USPS is implementing the 2015 Postage Rate Increase on Sunday, May 31st. 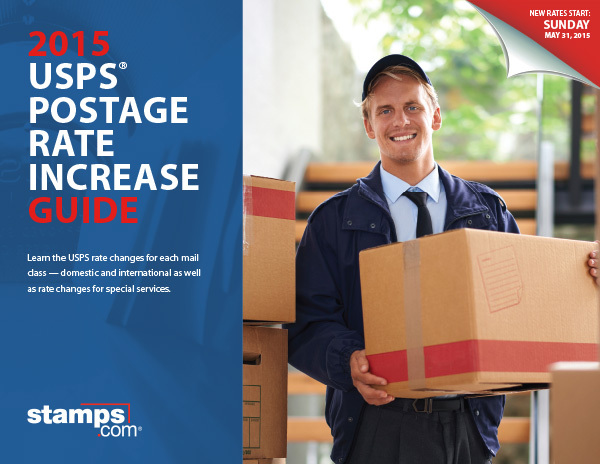 Check out Stamps.com’s 2015 USPS Postage Rate Increase Guide to understand what the changes are and how your mailing and shipping processes may be impacted. The FREE downloadable PDF Guide includes details on the USPS rate changes for each mail class – both domestic and international – and special USPS services. Additionally, the 2015 USPS Postage Rate Increase Guide provides tips and recommendations on when each mail class should be used along with a comprehensive Q&A to help with commonly asked questions around the 2015 USPS Postage Rate Increase. The guide is free and can be downloaded at: http://www.stamps.com/whitepapers/2015-usps-postage-rate-increase-guide.pdf. DOWNLOAD THE DIM WEIGHT GUIDE NOW! Sending packages via Military Mail can be tricky, especially when it comes to addressing the shipping label, determining whether or not to include customs forms and also understanding what you can and cannot send to military personnel. Learn how to ship packages to Military Mail APO/FPO/DPO addresses with the USPS. How to address a shipping label for an APO/FPO/DPO package. How Military Mail is processed and if you need to include Customs Forms for your packages. What to do in case your Military Mail package goes missing. Estimated Delivery Times by Destination and Mail Class. Restricted products and specific shipping tips for APO/FPO/DPO packages. Need more info about the Priority Mail rate changes that are starting on Sunday, September 7, 2014?